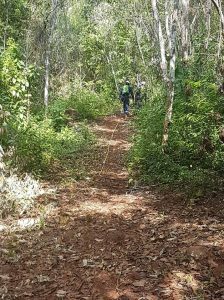 Following from early trials using older GPR systems in 1999 and 2003 by Groundradar, a recent re-visit has been made to the Cerro Matoso Mine in Colombia to trial the latest UltraGPR technology. The results were encouraging, and further field work is scheduled for July. Dr. Francke will be presenting a paper entitled “Realistic Expectations for Deep Ground Penetrating Radar Performance” at the 26th Australian Society of Exploration Geophysicists Convention in Sydney, Feb 18 – 22. The paper will address recent marketing claims of extraordinary performance by megawatt radars which are entirely outside the bounds of accepted physics.